Analysis: It's a bit odd to see the Falcons bring back Paulsen given the team recently signed former Titans tight end Luke Stocker, who profiles similarly as a blocking-first option. Still, the veteran tight end was reliable in his first stint in Atlanta, playing in 362 offensive snaps across 15 games. The nature of both Paulsen's and Stocker's contracts would suggest that, should one outplay the other during training camp, the Falcons could opt to cut ties prematurely. Analysis: Paulsen began the week as a limited practice participant from the knee and ankle issues that have plagued him for most of December. Assuming the 31-year-old avoids a setback Friday, he should be good to go for Sunday's season finale at Tampa Bay. Analysis: Paulsen's status remains largely up in the air at the moment, but perhaps more clarity will surface as Sunday inches closer. Look for Eric Saubert to slide into the No. 2 tight end spot if Paulsen can't give it a go. Analysis: Paulsen was limited in practice all week, but he appears on track to play through his lingering knee and ankle issues Week 16. Expect the depth tight end to see most of his offensive usage as a blocker, as per usual. 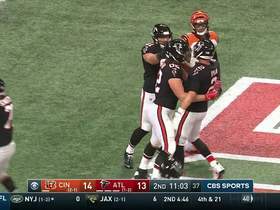 Analysis: Paulsen was able to play through his lingering knee issue against the Cardinals in Week 15 and continues to progress in his recovery. If the depth tight end is able to suit up against the Panthers on Sunday, he'll likely be used primarily as a blocker. Paulsen (knee/ankle) doesn't carry an injury designation going into Sunday's matchup with the Cardinals, Darren Urban of the Cardinals' official site reports. Analysis: Paulsen was a limited participant in practice each day this week. The UCLA product missed his first game of the season last week against the Packers. On the season, Paulsen has eight receptions for 72 yards and one touchdown. Paulsen (knee/ankle) was limited during Thursday's practice session, Vaughn McClure of ESPN.com reports. Analysis: Coming off two missed practices and his first inactive stint of the year last week against the Packers, Paulsen logged limited showings Wednesday and Thursday of this week and retains a chance to play against Arizona on Sunday. 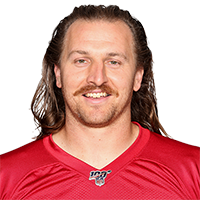 If the veteran tight end is unable to go, it will be second-year man Eric Saubert who sees an uptick in playing time against a Cardinals defense that's tied for the fourth-fewest touchdowns allowed to tight ends this season (three). Paulsen (knee/ankle) is ruled out for Sunday's game against the Packers, D. Orlando Ledbetter of The Atlanta Journal-Constitution reports. Analysis: Paulsen suffered knee and ankle injuries during last week's loss to the Ravens, and he will remain sidelined during Sunday's tilt against the Chargers. Second-year tight end Eric Saubert is expected to see an uptick in offensive snaps in Paulsen's absence. 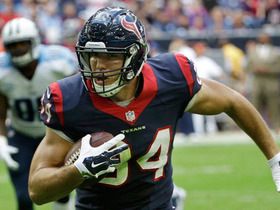 Paulsen (knee/ankle) did not participate in Thursday's practice session, Vaughn McClure of ESPN.com reports. Analysis: The veteran blocking tight end has logged consecutive missed practices after being pulled midway through the second quarter of Sunday's loss to Baltimore with knee and ankle injuries. As his status for a Week 14 tilt against the Packers remains very much in doubt, 2017 fifth-round draft choice Eric Saubert is primed to see an increase in his season-long offensive snap count percentage of 11.3. Paulsen (knee/ankle) did not practice Wednesday, Vaughn McClure of ESPN.com reports. Analysis: Paulsen exited Sunday's loss to the Ravens due to knee and ankle injuries, and continues to manage his recovery. It remains to be seen whether the depth tight end will get healthy in time to suit up against the Packers in Week 14. If Paulsen is unable to go, Eric Saubert will benefit from a slight increase in offensive usage. Paulsen is questionable to return to Sunday's game against the Ravens due to a knee injury, Kelsey Conway of the Falcons' official site reports. Analysis: Paulsen exited Sunday's tilt against the Ravens midway through the second quarter. If the veteran tight end is unable to return Week 13, Eric Saubert could benefit from a slight uptick in snaps. 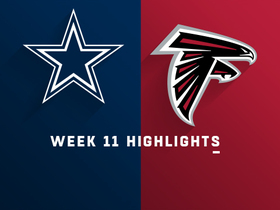 Paulsen caught both of his targets, logging 19 receiving yards during a 22-19 loss to Dallas on Sunday. 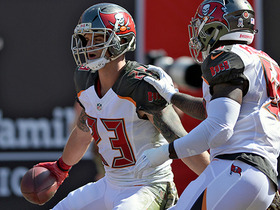 Paulsen hauled in both of his targets for 13 receiving yards during Sunday's 28-16 loss to Cleveland. 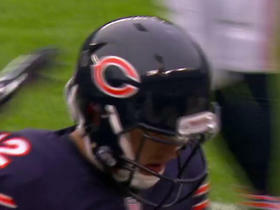 Chicago Bears quarterback Matt Barkley's pass to tight end Logan Paulsen falls incomplete on fourth down. 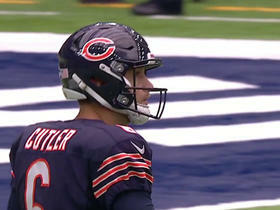 Chicago Bears QB Jay Cutler picked off by Tampa Bay Buccaneers safety Chris Conte for a 20-yard TD. 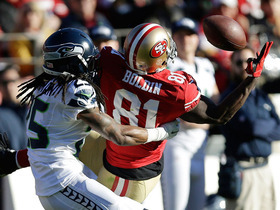 San Francisco 49ers receiver Anquan Boldin silenced the Legion of Boom with an acrobatic catch over Richard Sherman. Check out who else makes the list of best catches from Week 14. NFL Media's Adam Rank breaks down the fantasy players who swooped in and stole valuable points from your fantasy team in Week 13. Find out who's this week's That Helps No One Hall of Famer. 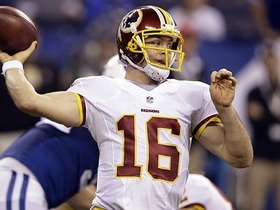 New Redskins starting quarterback Colt McCoy evades a trio of Colts defenders before firing a dart to tight end Logan Paulsen for a 16-yard touchdown. New York Giants cornerback Trumaine McBride intercepts Washington Redskins quarterback Kirk Cousins. 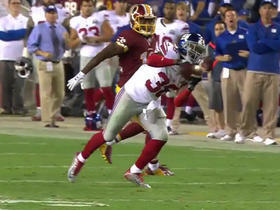 New York Giants cornerback Trumaine McBride recovers Washington Redskins tight end Logan Paulsen's fumbled ball.